Content Objective: I will be able to produce clear and coherent writing by creating a personal statement that meets the rubric requirements. Homework: Get your film permission slip signed. WRITE: What do you think the difference is between a purpose and a goal? 1. Today, you will take your last Achieve Level Set for the year. This will determine how much your lexile level has grown this year. Take the Level Set Assessment seriously. Read carefully. Do not guess unless you feel that it is an educated guess. The harder the questions get, the better you are doing. 2. Click here to go to Achieve. Login in under the Level Set for Mr. Westrup's class. When you finish, move on to Step 3. 1. You will be writing a personal statement about grit. Before you start, you should know the difference between a purpose and a goal. Purpose = This is your motivation for living. This is the reason for which you exist. This never ends. Goal = This is your objective. You set a goal for yourself so that you can fulfill your purpose. A goal can be replaced by a new goal. 2. To hear someone share their purpose and goal, click on the video to watch Inky Johnson explain how he has had to overcome challenges to achieve his purpose. Get headphones. 3. You will now write your personal statement. See the rubric below to read the prompt and understand what you will need to receive an A. 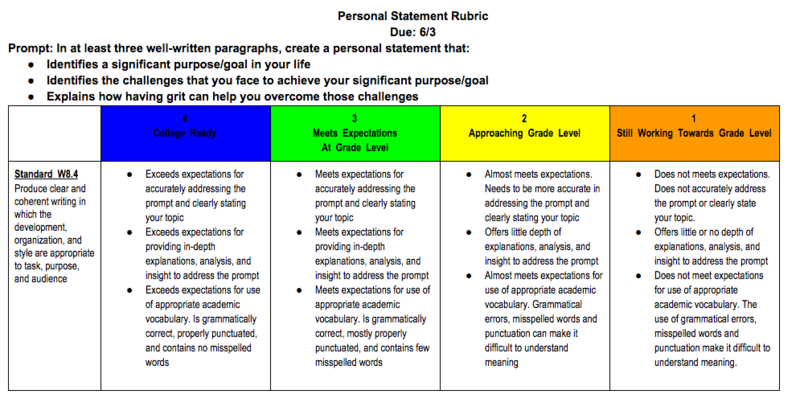 Below the rubric is an example of a personal statement written by Mr. Westrup.